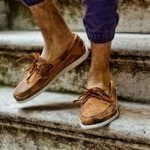 With warmer weather coming in, it’s time to start thinking about footwear. For most men, going sockless or wearing sandals can be daunting. The last thing you want to be thinking about as you walk around is whether or not your feet look like something out of Lord Of The Rings. To help get your feet summer ready there are a few things you can do to avoid any awkward Frodo situations. That stink: Feet don’t just naturally stink, so if you’re worried you’re one of those people with “naturally stinky feet,” chances are you just need to spend a few extra minutes in the shower and wash in between your toes. The odor you smell is coming from bacteria that’s eating the dead skin cells. Gross, but completely fixable. Clean feet and clean shoes will cut down on odor and, best of all, bacteria. So stop relying on the trickle down method in the shower and treat your lower half to a bar of soap. Appearance: Keeping your toenails trimmed is a given. If you haven’t been doing this, get on it. No one wants to see your weird yellow talons poking through. Trimmed nails do wonders to improve the look of feet. You might also want to invest in a pumice stone. It doesn’t have to be too fancy or expensive. They can usually be found at a CVS or Walgreens for a price that won’t break the bank. Taking a few minutes to rub around the heel and sides of your feet will take off all the dead skin and keep your feet clean and smooth. Rotate your shoes: Just like socks and underwear, you should be changing up how often you wear the same shoes. Regardless of how clean your feet may be, shoes need time to air out and breath, so try wearing a different pair daily or every other day. This will also help to cut down on odor causing bacteria. Keep your shoes clean: There are some preventative steps you can take to make sure your shoes stay clean. The first, and more expensive method is to invest in cedar shoe trees. The cedar will help wick away moisture and keep bacteria growth down. As an added bonus your shoes will smell incredible. If you’re finding it hard to justify the price, try using it only for your best or most expensive pair of shoes. Keeping your shoes cleaner will in turn ensure they last longer. If you prefer to give your shoes a DIY wash you can use a 50/50 spray of water and white vinegar. This mixture will also help to kill off bacteria. Use a toothbrush to really get into the soles of your shoes. The vinegar mixture will smell strongly at first but dissipate after a while. The final DIY method for cleaner shoes is to stick them out in the sun. Just like hanging laundry, shoes can benefit from spending some time airing outdoors, and the sun is a natural disinfectant. Be careful with darker shoes, as they could become sun bleached. When to go Sockless: Much like watermelon, sprinklers and short shorts, going sockless is a sign that summer has arrived. But bare ankles are not always appropriate, especially for work and business attire. Most, if not all professional settings still require socks. Shoes types will also determine whether you can go without socks. 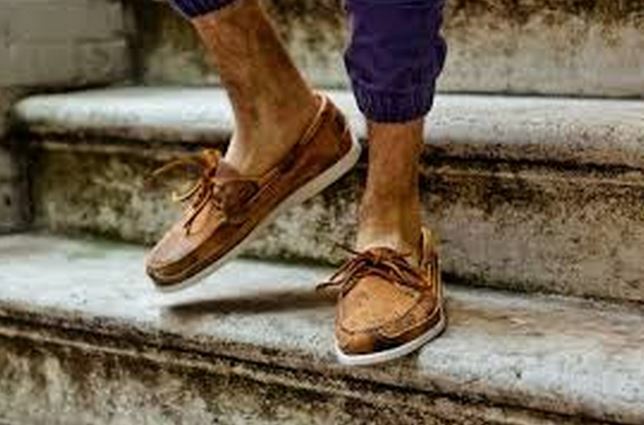 The best styles for bare ankles are loafers boat shoes, moccasins and any canvas shoes like chucks or Toms.